Keeping a cow healthy is complex. It's a combination of many things including the environment surrounding the cow and her nutrition. In order to keep a cow at optimal health, it's ideal to avoid any unnecessary stress. That way, her immunity remains strong and performance stays high. To achieve balance, the natural balance between free-radical formation and the defense system must be maintained. Because when it gets out of balance, a chain reaction is initiated, which includes oxidative stress. This can damage lipids and macromoleclues and can cause free-radical formation resulting in possible cell death and lowered performance. 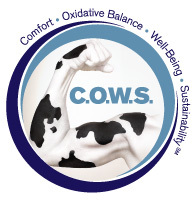 Dealing with oxidative stress requires more energy from the animal that could be used for milk production, growth, longevity and overall animal productivity. Clinical signs can include retained placenta, udder edema and mastitis, as well as delayed first estrus, delayed first breeding and repeat breeding resulting from failure to conceive or from early embryonic death.For producers, this means increased calving intervals, lowered production and, ultimately, culling of cows for failure to breed. Environmental changes, particularly those associated with heat stress can predispose cows to oxidative stress as well.All of these clinical signs are costly and reduce profitability for the dairy producer. By providing cows with behavioral comfort we offer them a state of freedom from physical and mental pain and anxiety. Alteration from this state can result in a predisposition to oxidative stress. The challenge of course is to accurately measure and objectively achieve this state. The Novus C.O.W.S. program is designed to help producers analyze the level of unnecessary stress on their herd and provides recommendations to improve areas that are in need.When a herd is in balance they are more efficient and productive resulting in greater profitability for the producer.